Last year I began a long intended project, to compile a list of Australian history living books organised in chronological order. I have organised the time periods around the chapters of Our Sunburnt Country, one of our favourite core books of Australian history and included recommendations of both picture and chapter books to accompany each chapter. This week a local friend asked for my recommendations for pre-European settlement and it was so easy to just send a link so inspired anew to pick up ‘the pen’ and continue on. Previous posts in the series are, Land of the Dreamtime and European Discovery of Australia. I’ve tried to mainly share in print or recently in print books, though some of the out of print (OOP) books I simply had to share as they are exceptional, such as the Doris Chadwick trilogy. The third chapter of Our Sunburnt Country ‘They Came – And Stayed’ begins in 1788 with the arrival of the First Fleet and details the early days of settlement and ends prior to the Rum Rebellion in 1808. Whilst attempting to write this series one decision I had to settle was the Indigenous Peoples history, should I collate books from an Indigenous perspective separately or include chronologically along with European history perspective, I decided on the latter. On 13th May 1787, the First Fleet consisting of 11 ships and 1300 people left England to found a penal colony in far away Australia. Upon landing eight months later on the 18th – 20th January 1788, the Naval officers, their families and the convicts set about establishing the European settlement of Australia. The penal colony faced many hardships and very nearly starved to death in the early years of settlement. Australia wasn’t a land unoccupied but a land peopled by Indigenous Peoples, however in the eyes of the British, this translated as a land to occupy, a land vastly different to far away England. The First Fleet is of particular interest to us as we are First Fleet descendants, our ancestor John Nichols came out on the Scarborough, being sentenced to seven years transportation for stealing hairdressing equipment. Ann Pugh was also deported for seven years and arrived in Australia on the Earl Cornwallis in 1801. They married in 1803 and had twelve children. In 1786 the British government sent convicts to Botany Bay to establish a British colony under the command of Naval Officer Arthur Phillip. On 13 May 1787 eleven sailing vessels and more than thirteen hundred people, including seven hundred and fifty prisoners, comprised the First Fleet and set sail from Portsmouth Harbour. It was an horrendous voyage, lasting for more than eight months, it was the beginning of European Australian settlement. Factual but an easy read. Governor Phillip and crew sail into Sydney for the first time and “find the finest harbour in the world in which a thousand sail of the line may ride in the most perfect security”. Popular with many, it’s the only picture book we’ve found detailing the day of landing, whilst it outlines the happenings clearly and has the potential to be a great story, it is um a little boring. Includes lots of interesting facts: why the British government wanted to start a settlement in remote, unknown Australia, what the ships looked like, who was on them, that there were 32 children on board the First Fleet, the people in charge left all the ammunition for the marines’ muskets and some of the clothes for the convict women behind, they took 747,000 nails but only six butchers’ knives for nearly 1300 people, what they did in the very first days, how they got on with the Iora people, the Aboriginal owners, why the people in the colony nearly starved in those first four years. Lots of text and practical detail in the drawings. One of my favourite picture books not only because of its powerful message but because of its thoughtful and clever approach to the topic of European arrival. John Marsden cleverly uses the story of rabbits (considered a damaging pest in Australia) as a metaphor for European arrival to Australia. This makes it a simple story for younger children and older children can make comparisons with actual historic events. Highlights the differences in language, culture, lifestyle and food of the Indigenous people and the new settlers. Shows the clashes that arose as a result of differing values, respect and use of the land and the effects of such dramatic changes. It is not well known that there were many children among the convicts sent in brutal conditions to Australia soon after settlement in 1788. Many of them died on the months-long sea voyages from Britain, and those who survived the appalling conditions of the convict ships faced further privations when they arrived in the struggling infant colony. ‘The Little Wooden Horse’ is the story of two such children who survive by the courage and strength borne of their deep friendship. The thoroughly researched story will give children an accurate and engaging picture of a child’s life in the days of early settlement. Haven’t read it but looks promising. Beth is a child convict, caught stealing on the streets of London and sent to Australia on the First Fleet. Through Beth’s story, we discover the unbearable hardships those first convicts suffered, not only on the long journey to Sydney Cove but also in the two years of near-famine following their arrival. The story also explores the new arrivals’ relationship with the Indigenous population, and the devastation that the Europeans brought with them. But through Beth’s experiences we also see the sense of hope that many in the new colony held for the future, and how they survived and in some cases thrived. This story was inspired by the experiences of Elizabeth Hayward, the youngest female convict with the First Fleet and the journals of naval officer William Bradley and Arthur Bowes Smyth, the surgeon and artist from the First Fleet vessel ‘Lady Penrhyn’. Not yet released but looks extremely promising. Sharing slightly out of time sequence here as Laperouse arrived at Botany Bay six days after the arrival of the First Fleet. Comte Laperouse was conducting a scientific expedition around the world and stopped in Botany Bay for six weeks. A priest from the French ship was the first Catholic priest to say Mass on the shores of Australia. Another of the priests was wounded at Pacific Island, died of his wounds and was buried at La Perouse, on the shore of Botany Bay, likely the first burial of a European on the East Coast of Australia. Julienne roams the fortress tunnels of Brest, France, cold, hungry and knowing only one thing about herself – her name. But soon she must abandon even that remnant of her identity. She becomes Jules, ship’s boy journeying to Botany Bay and beyond, on a voyage of discovery for the glory of France led by Commander Laperouse. Jules/Julienne sees new and strange things on board the ‘Boussole’ but what she would most like to discover is her own history, who is Julienne Fulbert? ‘I dared not move I was a bread stealer, a chicken feather villain, a salted mutton thief. I guiltily recalled the paper, the ink, the leather pouch I had stolen. And even though I had not intended it so I was a stowaway.’ Julienne roams the fortress tunnels of Brest, France, cold, hungry and knowing only one thing about herself – her name. Soon she must abandon even that remnant of her identity. She becomes Jules, ship’s boy, journeying to Botany Bay and beyond on a voyage of discovery for the glory of France, led by Commander Laperouse. Jules/Julienne sees new and strange things on board the Boussole, but what she would most like to discover is her own history: who is Julienne Fulbert? 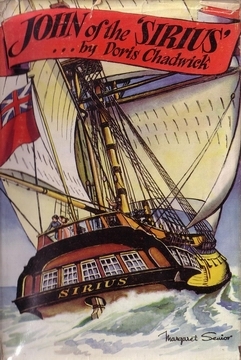 This trilogy written by Doris Chadwick follows the adventures of a young boy, John and his sister Sue as they journey to Australia with the First Fleet and begin life in the new colony. An effortless way to learn early Australian history, includes many actual events that occurred during the beginning of the English occupation of Australia, though adapted for young minds, the horrific conditions and treatments of the convicts are ignored. A huge family favourite of ours. John and Sue depart from England for Australia on the First Fleet. John’s father is a Captain of the Marines and the children belong to the small group of marine’s children who emigrated to Australia. Along the journey we learn of life on a ship, the diet and monotony. We ‘visit’ the various places the First Fleet ‘put into’ on the long voyage to Botany Bay. John always manages to become involved in adventures. The book concludes with the Fleet’s arrival in Australia and the raising of the flag in Sydney Cove on 26th January 1788. Highly recommend. The story of the first settlement, a very hard existence although John still has time for plenty of adventures. Issues such as convicts, chain gangs, starvation and hangings are mentioned but very sensitively. We ‘meet’ convicts such as James Ruse who plays such an important role in the survival of the colony and is honoured today as a pioneer farmer. Highly recommend. Based 18 months after the First Fleet’s arrival, and the settlers and convicts are in desperate straits and awaiting for the supply ships from England. John is friends with Nanbaree a local Indigenous lad who is adopted by Surgeon White, John and Nabaree enjoy lots of adventures. Highly recommend. Lizzie Harvey, a convict transported to Sydney Cove, is starving and overworked. She can barely find time to dream about the way things used to be, let alone write in her diary. But write she must. It is her only hope of reaching out to the home she has left behind, all those thousands of miles away across the sea. Depicts how life was for convicts during the early European settlement of Sydney. The story stays reasonably true to fact however it isn’t too grim for children, written for the over 10 set. The amazing story of Australia’s first surgeon and the boy he adopted. Beginning in 1788 as the new colony in Sydney Cove is established, based on true events. 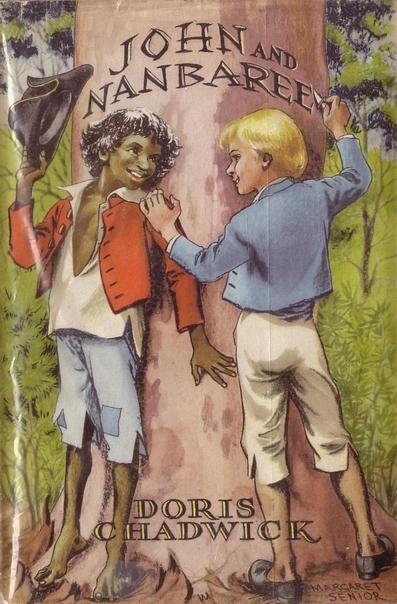 Surgeon John White defies convention when he adopts Nanberry, an Aboriginal boy who he manages to save from smallpox, he raises Nanberry alongside his son Andrew. Nanberry is clever and uses his unique gifts as an interpreter to bridge the two worlds he lives in. With his white brother, Andrew he witnesses the struggles of the colonists to keep their precarious grip on a hostile wilderness. And yet he is haunted by the memories of the Cadigal warriors who will one day come to claim him as one of their own. this true story follows the brothers as they make their way in the world – one as a sailor, serving in the Royal Navy, the other a hero of the Battle of Waterloo. No less incredible is the enduring love between the gentleman surgeon and the convict girl who was saved from the death penalty and became a great lady in her own right. Written for the over 12s. Written in blank verse about a six year old Aboriginal boy who was adopted by Surgeon White of the First Fleet and acted as interpreter for Governor Philip. Profusely illustrated with pictures from the Watling Collection. Thomas Watling was assigned to illustrate White’s collection of plants and animals and also drew several portraits of Nanbaree. Not an easy read, more for older children. A collection of short stories, both historical and contemporary, based on real people and real events. What an incredible idea it was to found a colony of convicts eight months’ sail away from Great Britain. In a land with no cities, no farms, no rich spices. The Dutch, the French and the Portuguese had known about this place for two hundred years, the Chinese had known about it for even longer and no one was interested in it. No country had ever thought to send a colony so far away. Why on earth would you bother? By the 1790s orphaned Barney Bean finally has his own farm in the early NSW colony. All his dreams are coming true! But now we are to learn of Barney’s biggest secret yet: how he helped Australia’s first bushranger escape. Was Black Caesar a wronged man, an ex-slave who vowed to be free? Or was he a laughing villain, a trickster who planned to terrorise the colony? And in helping him, did Barney do right or wrong? A beautiful children’s book set against the backdrop of the First Settlement of Australia. It describes the friendship of an orphan boy from England, Leonard with an Aboriginal girl Milba. Leonard and Milba are mesmerised by the peculiarity of each others’ worlds. The stunning illustrations have been created by using large hand-painted ceramic tiles, each colour on each tile was individually fired, then photographed and overladen with the author’s text! Watkin Stench and his fellow ships’ rats discover that the strange port they have called into is no ordinary anchorage. There is no harbour, no roads or villages, just hot sun, little water and local humans unlike any they have met before. Watkin will have to adapt to his new life in Australia. The extraordinary story about the friendship between Captain Arthur Phillip and local Aboriginal, Bennelong is one of Australia’s most important and intriguing stories, yet remains largely unknown. The background of the first settlement in Australia heightens the polarity between the two worlds of these two people, traditional Aboriginal culture and values versus European culture and values. Age range 6 to 9. The books available for this time period are some of the best of Australian history 🙂 I always love revisiting our favourites here and was delighted when researching to find some extremely promising new titles. Love to hear your thoughts when you’ve read them. Thanks for this! We are using Our Sunburnt Country for our history this year, and have been looking for supplemental books. You’ve done all the work for me! So thrilled to be of assistance. Keep checking back, working my way through the chapters. Some terrific Australian history books out there. Thanks! 🙂 Rather inspired to read all these books myself, sooner than intended. Be sure to go back and check out the other related posts and check back for more. Just to clarify for your readers that the authors are one and the same for the diary of Julienne Fulbert. On Board the Boussole appeared in Scholastic Australia’s My Story series in 2002. Now the story is its 16th year, featuring in Scholastic’s My Australian Story series, although it has undergone some title changes. Latest edition is out in July – Stowaway to Botany Bay. Chrissie’s Convict Girl, the diary of Mary Beckwith, who left Port Jackson to travel with Nicolas Baudin on his voyage of exploration and science, also appears in the My Australian Story series. A new story by Chrissie is due out in the same series mid year 2019. Thank you for your writing, so wonderful to find Australian history titles for children. Wishing you all the best with your new book and look forward to reading it.